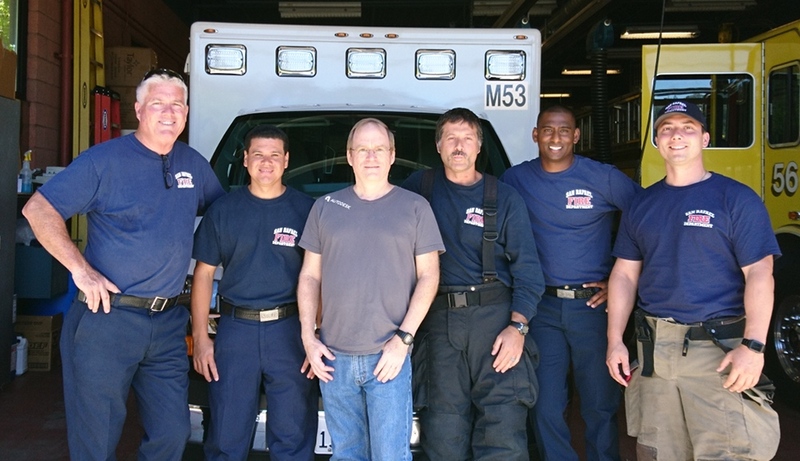 Me with the paramedics of Station 56, San Rafael Fire Department, four and a half days after they came to my aid during my heart attack. Before I tell you the story of my heart attack experience, let me say this: I’m a patient, not a doctor. I have had no medical training. If you think there’s a chance you or someone near you is having an heart attack, call 911 right away. And know the symptoms of heart problems, as described by the American Heart Association. Eat well. Exercise. Avoid tobacco. Stay active. Maintain a healthy weight. Get regular checkups, including blood pressure and cholesterol screenings. If you feel any chest discomfort at all during exercise, get it professionally checked out, even if (perhaps especially if!) it goes away when you stop exercising. In far too many cases, the first reported symptom of heart disease is sudden death. We can’t know how many of those people had previously experienced some minor chest discomfort that they failed to bring to the attention of others. In hindsight, I know I had some mild chest pain which I did not report, because it didn’t feel serious. Don’t be like me — get medical attention before your heart attack! I awake with a pain in my chest. I tell my wife that I need to call a doctor. She grabs a phone, fiddles with it, and says she can’t find the number for our health plan’s advice nurse. I say, “Give me the phone. I’ll call”. I don’t have time for advice nurses. I dial 911. The pain isn’t overwhelming. Many times, I’ve felt much worse pain — a skinned knee, a paper cut, the cold of putting my arm deep into icewater of a cooler to fish out a cold drink — all of these can cause much more profound and attention-getting pain. But what concerns me about this particular pain is its familiar character. It’s a pain in my chest that feels exactly like the discomfort I’ve been recently feeling when I mow the yard or otherwise exert myself. But now, it’s many times more intense than it has ever been before, and I’m not exercising. I suspect it’s probably my heart. I’m not really sure what it is, but I AM sure that I want professional medical attention, now. The most similar sensation I can remember is from the coldest days of midwestern winters where I grew up. When the temperature is well below zero Fahrenheit, inhaling suddenly can cause an uncomfortable tightness in the chest, as the lungs fill with frigid air. This isn’t exactly the same sensation as I had, but it’s close. The 911 operator answers with, “911, state your emergency”. I say “I’m feeling chest pain”. She immediately says, “I’ll transfer you to medical”, and another operator quickly picks up. I repeat that I’m feeling chest pain, and she quickly asks me where I am. I provide my address, slowly, and clearly. She asks just a couple more quick questions, and then says, “OK, the paramedics are on their way. I’m going to ask you some more questions, but these won’t slow them down at all, OK?” She proceeds to establish that I have no history of heart disease, that my father had a healthy heart except for some mitral valve issues, but that I had an uncle who died relatively young due to complications of a heart attack. She finds out that my wife and children are in the house with me, and gets the ages of the kids. She asks if we’ve got asprin in the house, and we send my wife to get one out of the medicine cabinet, and I take it. Then she gets my wife to open the front door and turn on the lights so the paramedics will be able to come in. Everything is handled quite calmly and professionally. I’m a bit surprised at how seriously they take this; not once do they express any doubt or try and make me prove that I have a condition that warrants rapid professional attention. Though I’m concerned, I’m not panicking, because I actually feel reasonably well. My wife says I’m pale, but I’m still lying in bed, relaxing as much as possible, breathing deeply, and not in any particular physical distress. The chest pain is there, but it’s not severe. I’m not sure what’s going on: heart attack is on my mind, but this doesn’t feel as serious as the stories I’ve heard about them. I’m fully awake and alert. At 1:21am, about eight minutes after I called 911, the paramedics arrive. As a paramedic is putting electrodes on my chest, he explains, “We want to check and see if it’s your heart”. I reply with an understated, “Yeah, that’s my concern, too.” As if there were some other reason I’d be inviting the paramedics into my home in the wee hours of the morning to talk about chest pain. They take my pulse and blood pressure, and start an electrocardiogram. I think I overhear one of them saying something about a cardiac event. They start an IV of plavix. They give me anti-nausea medication, even though I’m not feeling at all nauseous. They give me oxygen. I start breaking out in a cold sweat. They ask what kind of health insurance I have, and quickly determine that I should be transported to the Kaiser hospital which is less than a half mile from my house. This will be my first time ever in an ambulance, and it won’t last long at all. They roll me out of my house into the ambulance at 1:31am, eighteen minutes after I first called 911, and ten minutes after they arrived at my home. As they’re putting me in the ambulance, I notice one of the medics use the term “heart attack” for the first time. I’m still reasonably comfortable, though there is no doubt in my mind that something serious is wrong. I remember two thoughts going through my head. The first is that I’m really happy that I can basically relax and let these professionals do most of the hard work. I feel sorry for those who had to go through this sort of thing a hundred years ago. The second thought is that I wonder if I should give someone my computer passwords, so that critical information and family photos won’t be lost if I die. I decide that I’m feeling really well, and I’m going to make it through this fine, so I don’t go to the trouble of dictating passwords. In the ambulance, they tell me to relax as much as I can. I can feel the curves in the roads, and I know exactly where we are as we make each of the four turns that lead us the short distance to the ER. I relax, breathe deeply, and close my eyes. One of the guys says, with some urgency in his voice, “Don’t leave us now!” I open my eyes and say, “I’m not leaving!” I was just following orders to relax, but I decided to keep my eyes wide open from now on. I don’t want them thinking I’m unconscious, needing a shock, or anything like that. One of the paramedics tells me that it will get chaotic when we reach the ER, with lots of people doing lots of things. He is soon proven correct. In the ER, they give me more medicines intravenously, including morphine, though I’m still not feeling much pain. But I am uncomfortable and having to put a lot of effort into maintaining my breathing. I don’t request any pain meds, but I don’t refuse any, either. I am asked numerous questions about my medical history and how I’m currently feeling, and I’m always able to understand and clearly answer the questions so that everyone in the room could hear the answers. They never ask me to repeat. They take more measurements on an electrocardiogram, discuss how much Plavix I had been given by the ambulance crew, and give me some more. It’s not long before a doctor tells me that I am in the middle of a heart attack, and that he recommends a catheterization procedure, where they will go in through the blood vessels in my leg, and remove the obstruction in my coronary artery. He says, “There are some risks to the procedure, but at this point, the benefits strongly outweigh the risks”. That sounds reasonable to me. They present a consent form for me to sign. I don’t read it very thoroughly. Perhaps I should restate that. I don’t glance at a single word of it! I scribble a signature. Much later, when I was given a copy of it, I noticed that my signature was remarkably legible, probably more so than normal. I wonder how those consent forms can carry any legal weight, because it seems like, if ever there was a case of signing a contract under duress, this was it. As they are preparing me for the cath lab, a nurse tells me she’ll be injecting me with a sedative called fentanyl. I know what that is. This dulls my memory of the room and the procedure. I do remember that they had me sort of propped up, halfway between sitting and lying down. They put equipment behind me and in front of me. I assume this is for X-rays. Periodically, they ask me to rate my chest pain on a scale of 1 to 10. I reply with something in the 5-7 range or so. They ask this numerous times, but then things change. They ask me the same question about my chest pain, I consider it for a moment, and I say, “Zero. The pain is gone.” I feel much better. From that point on, the heart works normally. The blockage of my artery is cleared. They start wrapping things up and getting me ready to leave the cath lab. I start feeling really cold, and shivering, slightly at first, and then just uncontrollably. I don’t know if it was the restoration of blood flow that caused that sensation or what. I hadn’t noticed feeling cold until after they unblocked my artery. They roll me out of the cath lab, and someone gives me a warm blanket. That’s the best blanket I can remember ever feeling. As they roll me out, I see my wife and my sister are there. My sister lives about a 45 minute drive from the hospital, and I’m quite surprised to see her. I’m not sure what time it is, but it’s well before sunrise, so she must’ve gotten out of bed in the middle of the night to drive over and see me and my wife. There’s a whiteboard in my room, with my name, the nurse’s name, and various information. Under the section for “Today’s plan” is “Stay in bed until 7:00pm”. The sun hasn’t risen yet, so this is going to be a full day in bed. I can deal with that. My heart is feeling fine. However, there is some pain in my leg where they inserted the catheters to reach the heart. Not only is there some pain there, but it’s also bleeding a bit. There’s a conflict here: they’re giving me anti-clotting medication to protect my heart, but that same medicine is preventing my leg from clotting properly. Eventually, the doctor tells the nurses to stop my IV anti-clotting medications, and to place direct pressure on the wound on my leg for a half hour to stop the bleeding. This was the most painful part of the entire hospitalization, though still, it wasn’t so awful. They offer me morphine to take the edge off the pain, and I don’t refuse. The morphine has a very strange effect. My wife and sister are in the hospital room with me. I can barely make out two human forms over near the door to my room, and I can’t tell which of them is which. Until I get a look at their faces. Their faces look to me like extremely clear and detailed 2-d photographs, easily recognizable, tacked on the top of vague blurry bodies. As they turned toward me and away from me, their faces appear and disappear in a most interesting illusion. Overall, I really don’t like being drugged. Around 9:00 or 9:30 am, it’s time to call in to work, so that they would know where I was. I have been at a new job less than three months, and I don’t have a phone number for my boss. But I’m able to look up the company’s phone number, and get hold of the receptionist. I tell her that I need to call in sick, but I don’t know the my boss’s phone number. She says I can use my computer to send him a message. I tell her I’m in the hospital, without my computer. She says, “In the hospital? Are you all right?” I say, “Yeah, I’m fine, but I did have a heart attack last night.” She almost screams at me, “You just had a heart attack and you’re worried about calling in sick! ?” I try my best to be reassuring, but I think I might have freaked her out a little. Mid-morning, technicians come in to do an echocardiogram, an ultrasound scan of the heart. The cardiologist looks at the picture on the screen, and says, “The pump is strong”. Those are comforting words. After 7:00pm, I’m allowed to leave the bed and sit up in a chair. My leg hurts when I transition between the bed and the chair, but once I’m in the chair, sitting is comfortable. The next morning, the nurse helps me get up, and, using a walker, I manage to walk a feeble lap around the ICU. It feels good to walk. My heart feels completely fine, but my leg feels pain when I change between lying, sitting, and standing. Once I’m standing, walking isn’t painful, though. My nurse tells me that I’m the healthiest patient in the ICU. I’ll take my victories where I can get them. My entire time in the ICU, they don’t do very much to me — except they do a LOT of close monitoring. They keep a blood pressure cuff on me continuously, and it automatically squeezes my arm on a periodic schedule. They keep a pulse oximeter taped to my finger to monitor the oxygen content of my blood. They draw blood samples every half hour, to monitor my enzyme levels. I have electrodes continuously monitoring my heart and respiration. I have two IV catheters, one in each arm, which aren’t being used, but the nurses refuse to take them out. They explain that, if there’s an emergency, they may want to get medicine into me very fast. The nurses don’t go into detail about what emergency might happen, but I find out later that heart rupture is a concern in the first days after a heart attack. The heart attack kills some muscle cells because they’re starved for oxygen. Later, the patient’s immune system cells start attacking and removing the dead heart cells. This can weaken the heart wall, causing a rupture. That is every bit as serious as it sounds. It’s often fatal, but immediate surgery can sometimes fix it and allow for recovery. Fortunately, this is a rare complication of a heart attack, and furthermore, because my heart attack was treated so quickly, there is very little damage to my heart muscle, so my risk of such a serious complication is even less than typical. Late in the day, I’m transferred from the ICU into the telemetry ward. They would have transferred me sooner, but space wasn’t available in the lower-intensity ward. The telemetry ward is called that because, instead of being directly wired to an ECG, my electrodes are connected to a radio transmitter, which relays my info to a monitor. This allows me to get up and walk around much more easily. Several times, the doctors and nurses have told me to inform them if I feel any chest pain. While I’m lying in the telemetry ward, I do feel a subtle but distinct pain in my chest. It’s a very different feeling than the discomfort I felt before and during my heart attack. It’s like a barely perceptible muscle ache. If it were anywhere else in my body except my chest, I would dismiss it and not say a thing. But I call the nurse. She starts hooking up more electrodes to do a 12-lead ECG. She asks me to rate the pain on a scale of 1 to 10, and I say, it’s, at worst, one-half. She says I have an open prescription for narcotics, and asks if I want anything for the pain. I say, “No no no no no!” She obviously didn’t hear me describe how mild the pain is. It turns out that the ECG is perfectly normal, and the pain I’m experiencing is not a symptom of anything serious. The third morning, I wake up, and get out of bed to start pacing back and forth in my room. My wife comes to visit, and we start walking laps around the floor. It feels good to walk, though my leg is still in pain, especially during transitions between lying sitting, and standing. A team of doctors comes to visit me while I’m pacing around in my room. They say they’re here for bedside rounds. I ask, “Does that mean I have to get in bed?” They laugh and assure me that I can remain standing. I was only half-joking, and I’m relieved that I can remain standing, because, while it’s easy for me to stand, and easy for me to lie in bed, it’s a little more difficult to switch from one to the other. They let me go home at about 5:00 on Friday, after a bit more than two and a half days in the hospital. Once home, I take the dog for a walk around our block. It’s about a half mile, and level, but it’s a start. In coming days, I increase the length and intensity of my walks, and start taking on hills. My dog is very happy. On Sunday, four days after my heart attack, I walk into the fire station to thank the crew of paramedics that came to my aid. All of the people who helped me are at the station when I stop by, and they are very happy to see me. The feeling is mutual. We have a fantastic reunion. The following Monday I come in to work. The first thing I do is go walk over to the reception desk, and say good morning to the woman who took my call the morning after I had my heart attack. I apologize for causing any concern, and I want to let her see that I’m up, breathing, and walking. Life is returning to normal. I walk every day in the weeks after my hospitalization. Nine days after my heart attack, I mow the yard. A day or two after that, I ride a bicycle. I’m quickly to the point where exertion is more comfortable than it was in the months preceding my heart attack. Before my attack, my artery had been slowly being blocked, so slowly that I wasn’t really noticing it. But now that it’s open, the contrast is striking. After getting out of the hospital, the pain in my leg gets noticeably better every single day for the first two or three weeks, though it takes about two months before all of the discomfort is completely gone. In many ways, my heart attack was extremely mild, as indicated by what did NOT happen to me. My heart didn’t stop. I didn’t lose consciousness. I didn’t go into fibrillation. I didn’t receive an electric shock. The doctors didn’t cut into my chest. They didn’t give me general anesthesia. They didn’t do bypass surgery. I didn’t experience much pain. I didn’t lose any significant amount of heart muscle, so my ability to exert myself was not reduced. I really had it pretty easy! A few days after my discharge from the hospital, I visit my cardiologist for a follow-up appointment. His written instructions to me begin with, “YOU ARE NOT FRAGILE!” He explains to me that they opened up one artery, and while they were there they checked the others, and they were all clear. So he told me I need to get out and exercise, and it is impossible for me to have a second heart attack, at least in the short term. That’s my ticket to start riding a mountain bike regularly. It has now been a year since my heart attack, and my recovery is essentially complete. My cardiologist has taken me off of all medications except Atorvastatin, vitamin D, and low-dose aspirin. He has told me he doesn’t want to see me anymore; I should instead contact my primary care physician for any concerns I may have. He says that, if I maintain good diet and exercise habits, my chances of avoiding any further need for cardiac intervention are excellent. During the past year, I have had lots of vigorous hill-climbing exercise, both on foot and bicycle. I hadn’t been exercising significantly before my heart attack, but since then, I’ve been walking at least five miles every day, on the steepest hills that I can find around here, climbing 400-600 feet at a brisk pace. I also ride my mountain bike a few times per week, climbing 600-800 feet on each ride. I’m eating better, mostly plant-based foods, and have lost weight. It has been a very effective motivator. I am extremely grateful for modern medical science and technology, and the people behind it. I experienced an event where my right coronary artery, one of the three major blood vessels feeding my heart, was 100% blocked. That is a major cardiac event, in the sense that it is not compatible with life for very long. Had this happened to one of my ancestors, it would have had fatal results rather quickly. But in my case, I got very good treatment. very quickly. I only missed three days of work, my time in the hospital was reasonably comfortable, and I made a quick and full recovery. I think about that every day, and every day I am amazed! Nevertheless, I’m working hard to avoid a repeat. Next → Next post: Say it ain’t so! WWV/WWVH/WWVB on the chopping block? Keep taking good care of yourself!! !